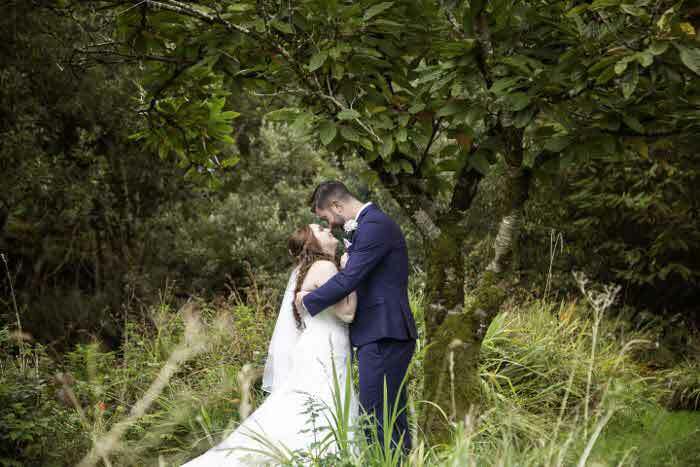 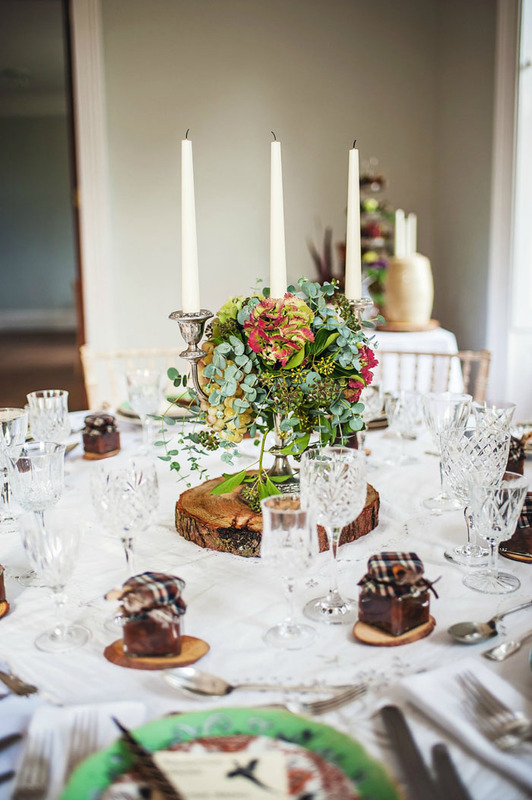 A fusion of green and orange hues, leafy floral arrangements, apple chutneys and vintage china dressed with country tweed set the scene for this gorgeous styled shoot that Bride just had to share with readers. 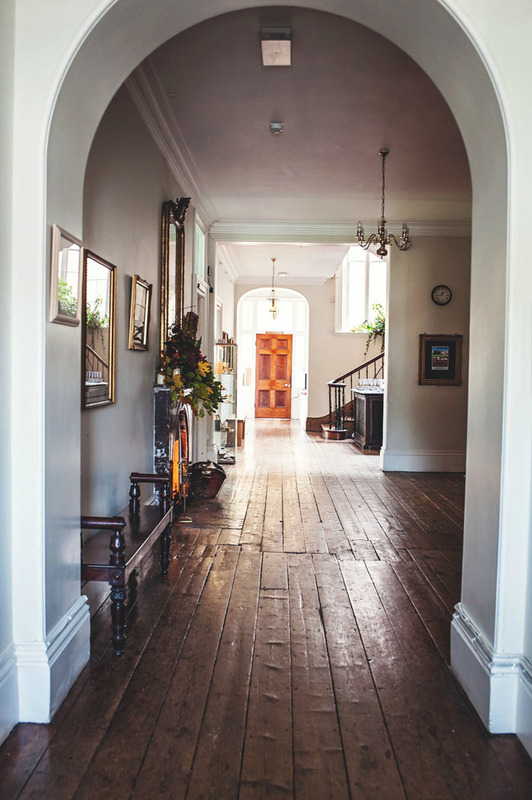 We go behind the scenes to discover how you can steal the look. 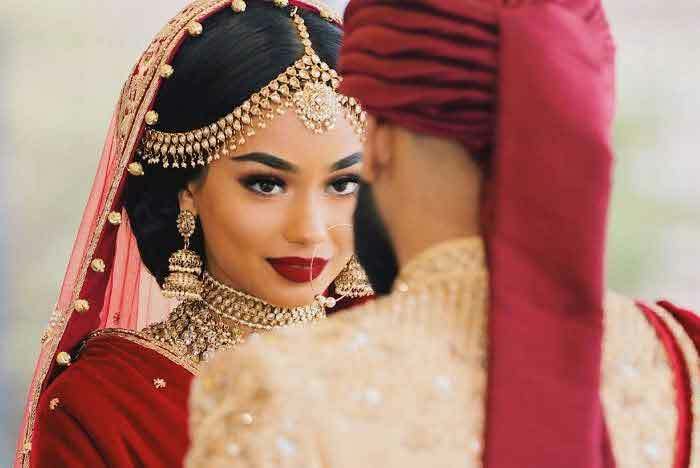 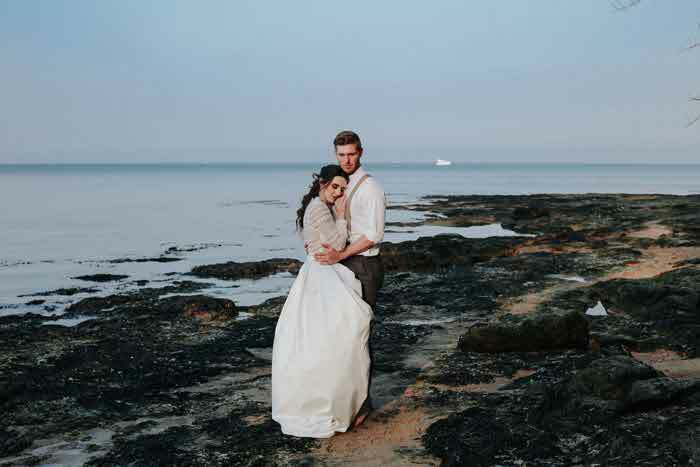 Inspired by the surroundings of the grand Georgian Knighton House in north Dorset – a wedding venue nestled above fields, woodlands and the winding River Stour in an Area of Outstanding Natural Beauty – this shoot featured a rich, earthy palette throughout. 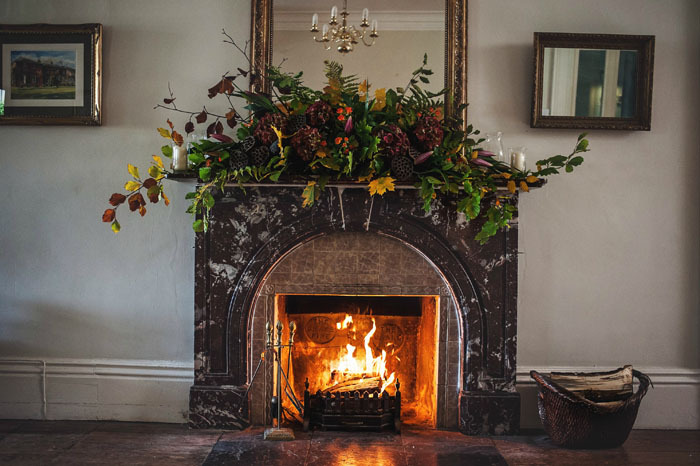 The theme was influenced by Knighton House’s backdrop with the striking colours of autumn on the tree-lined driveway, the foliage and feathers of the game hunting season and the rich heritage of the house itself. 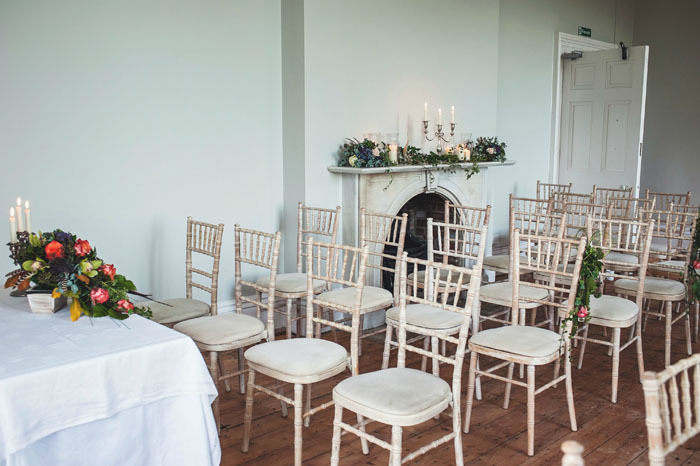 Although the ‘country’ theme is rustic by nature, the styling retained an air of elegance, in keeping with the surroundings. 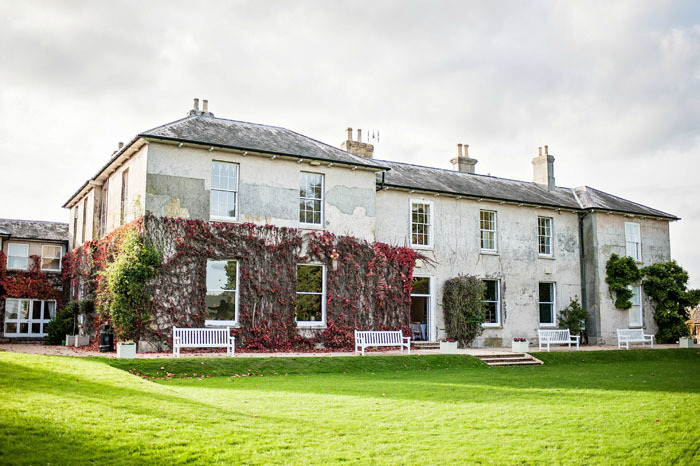 Formerly the dowager house of Dorset's Portman Estate, Knighton House has been home to a girls’ school for the past 65 years. 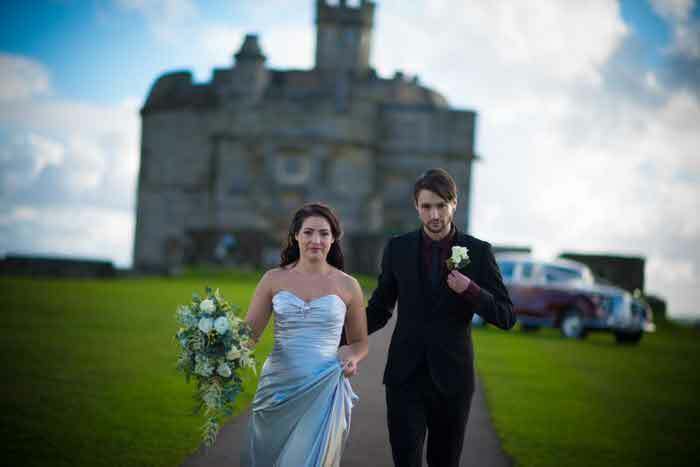 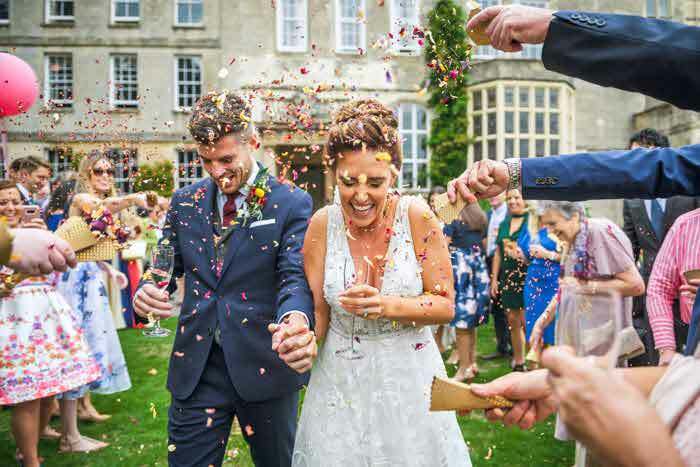 With Knighton having recently launched as a new Dorset wedding venue in October, a small collection of local wedding suppliers came together to create a collaborative autumnal inspiration-shoot, creating seasonal tablescapes and floral designs. 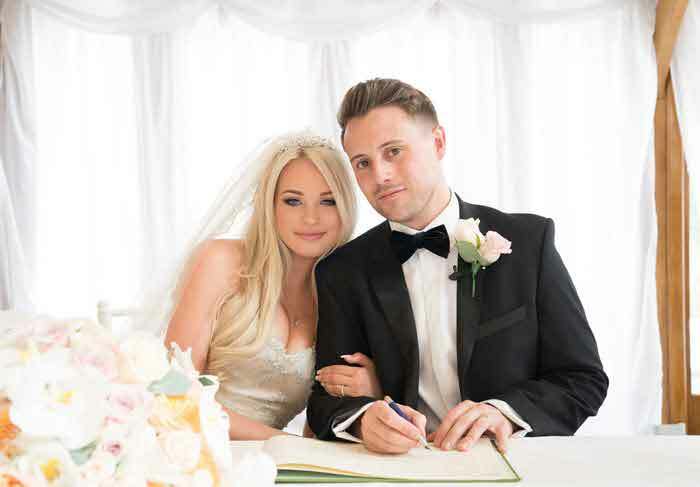 To showcase the dual purpose of the newly renovated Portman Suite, the rooms were dressed to serve as both civil ceremony and dining rooms. The tables in the drawing room were laid for a formal evening supper and a less-formal Champagne afternoon tea was laid in the library. 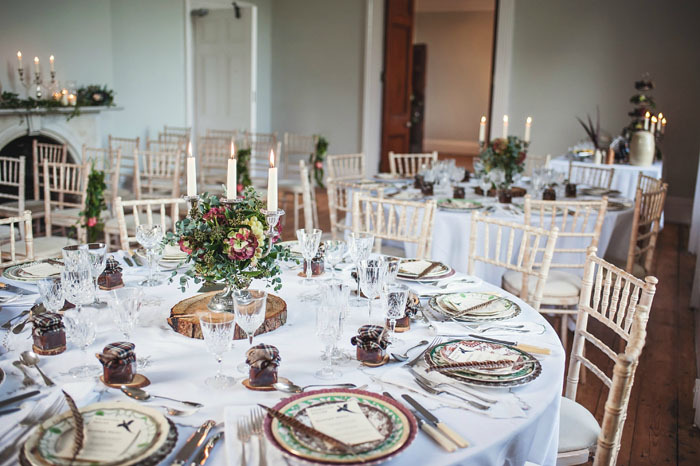 Combing the country feel of the theme, the tables were dressed with candles, flowers, autumn menu cards and vintage china, glassware, cutlery and linen. 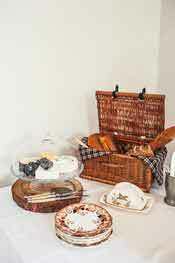 Favours were handmade apple chutneys and bramble jellies dressed with country tweeds and game feather detail. 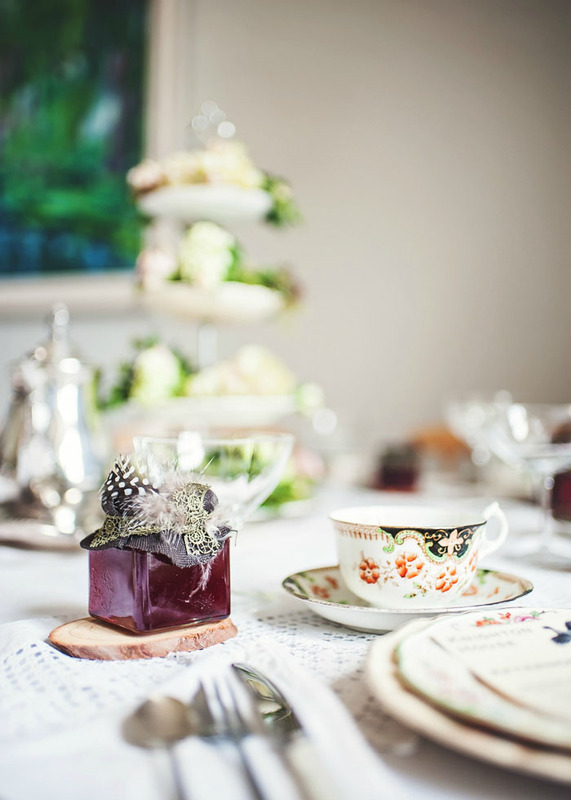 Vintage china in tones of green, brown, red and orange, with pieces depicting country scenes and bird motifs were chosen to reflect the rich colours of autumn and then layered to create a sophisticated, coordinated look across the champagne afternoon tea and supper tables. This was a creation by Forget-me-not Vintage. 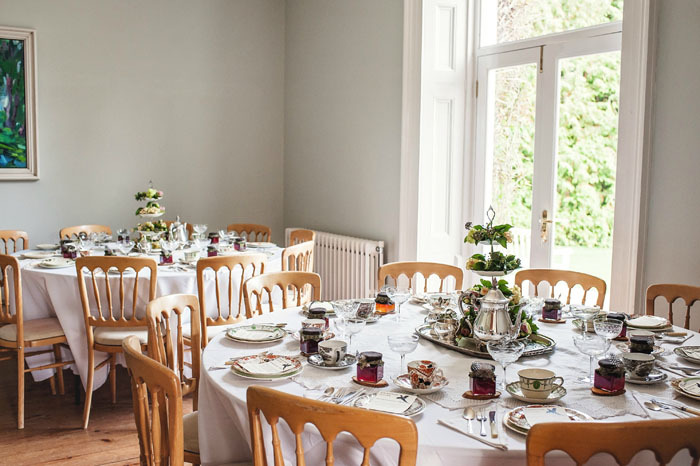 Elegant silver tea services were used on the afternoon tea tables along with vintage champagne saucers, vintage cutlery, table linen and napkins. 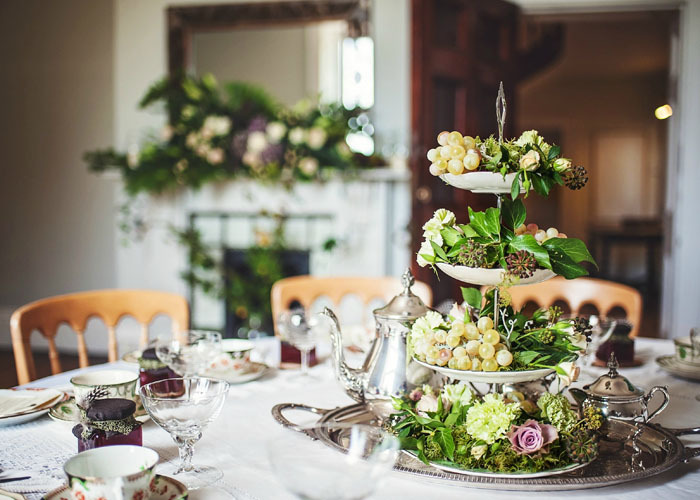 Four-tier china cake-stands were dressed with Old Dutch and Lenne spray roses, carnations, ivy, moss and grapes to serve as stylish country centrepieces for the round tables. 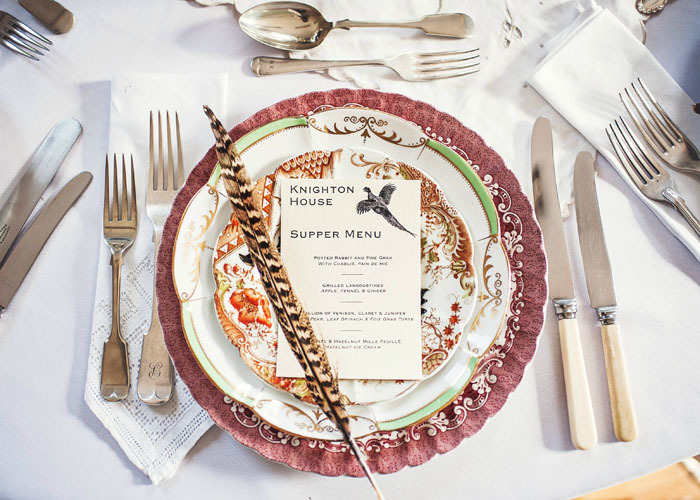 On the supper tables, the vintage plates were layered and the country look was completed with a pheasant feather and an autumn menu card printed on linen paper, placed at each setting. 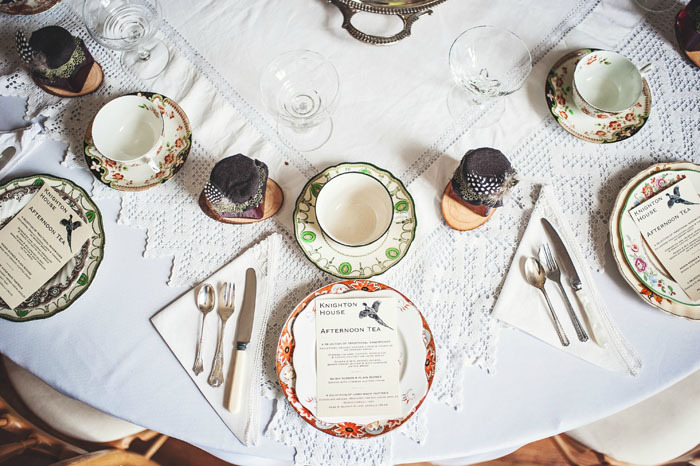 Classic vintage table linen, monogrammed napkins, glassware and faux bone cutlery were used to create the formal supper dining place-settings. 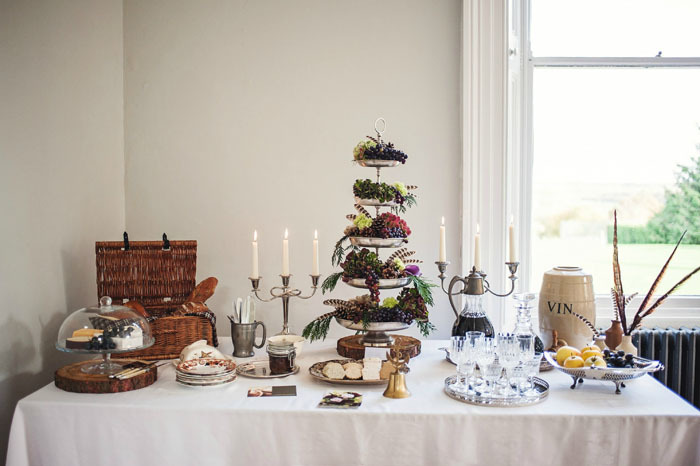 The supper table centrepieces were classic silver candelabra stood on rustic wood slices, dressed with hydrangea Rodeo Classic and grapes in rich, wine reds and softened with eucalyptus. 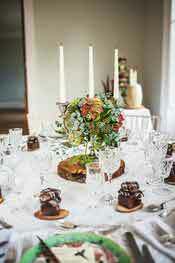 The candelabra provided a beautiful soft candlelight for these stately supper tables. 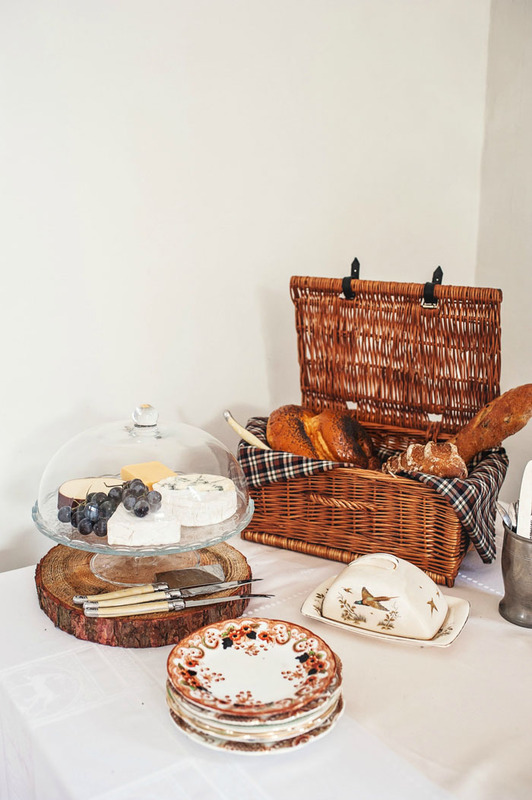 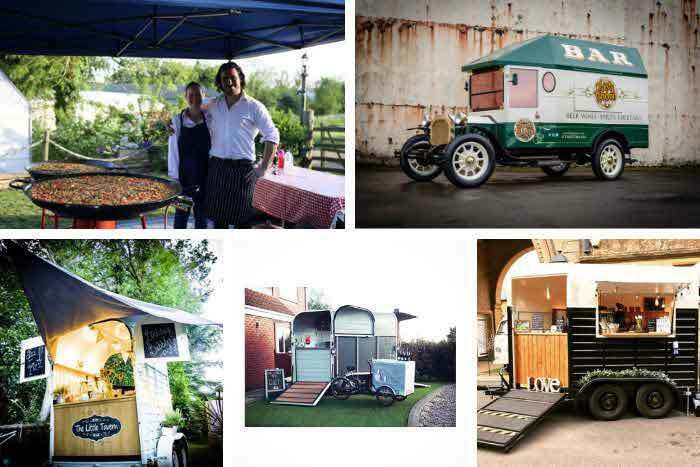 The cheese and wine table was styled on a rustic trestle table in the Drawing Room and dressed to complement the supper tables with themed vintage china, silverware, vintage glassware and finished with cheeses and accompaniments, artisan breads, fruit from the orchard and feather details. 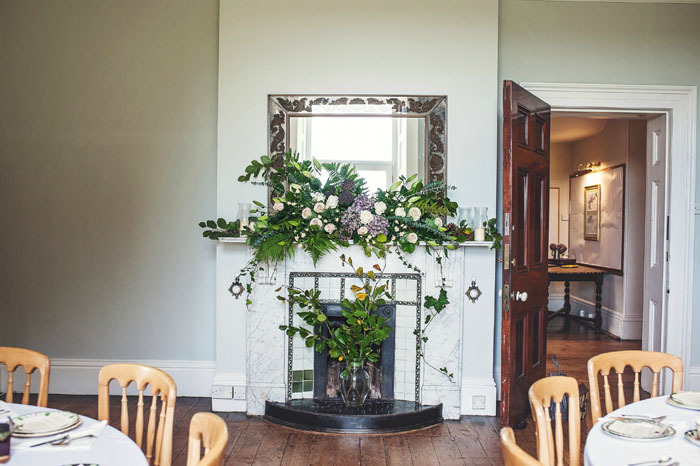 The floral design throughout the house was created by Elizabeth Morgan Flowers, and centered around the glorious autumn colours of the woods and trees surrounding Knighton House, softened with foliage foraged from the grounds. 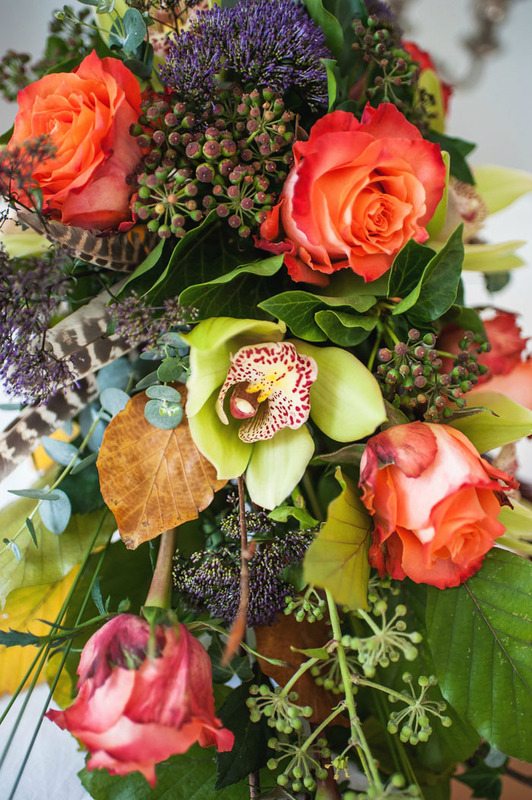 Pops of colour were provided by red Valentino lilies, lotus heads and spray rose Babe. 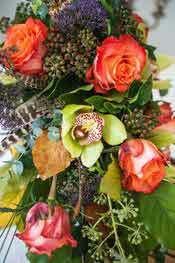 The stunning autumnal hued hydrangea was used throughout the arrangements. 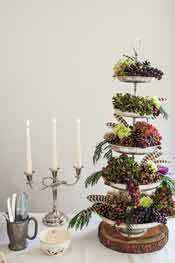 Subtle autumn touches were provided by the use of cones, moss and ivy, and rich dark grapes were used on the cheese and wine table with a paler delicate grape on the cake-stands in the library. 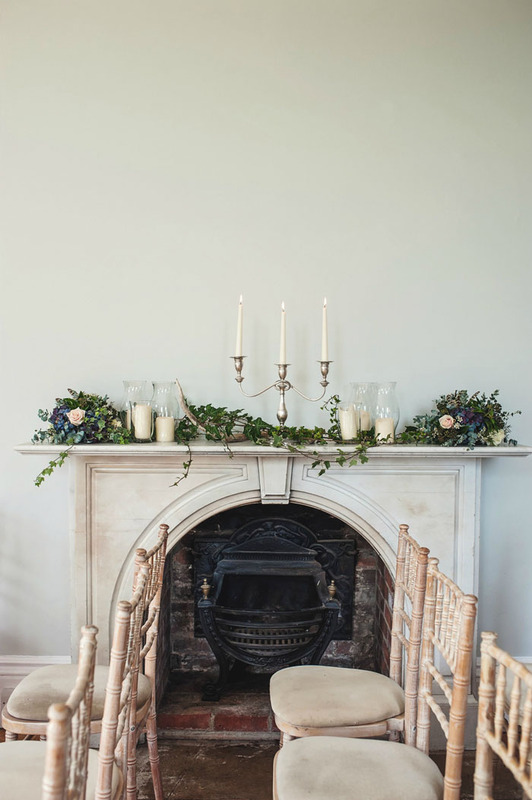 Storm lanterns and pillar candles adorned the mantles along with white Sapporo lily, brassica, lotus heads, Sweet Avalanche and spray Lenne roses. 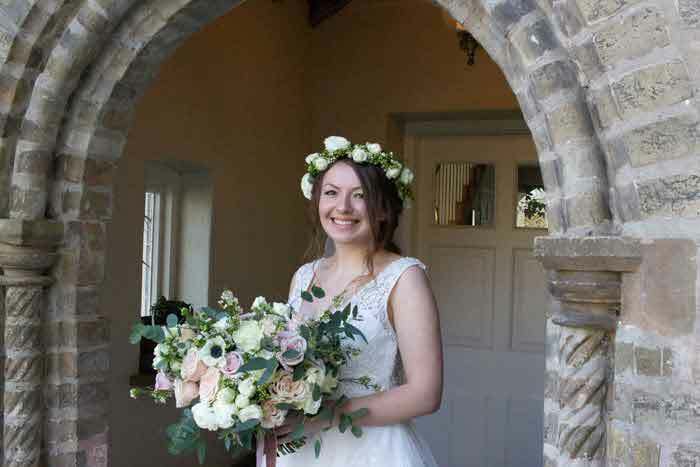 In the Drawing Room the bride’s cascade bouquet featuring Julischka rose, cymbidium, purple trachelium and pheasant feathers which doubled as a ceremony table arrangement. 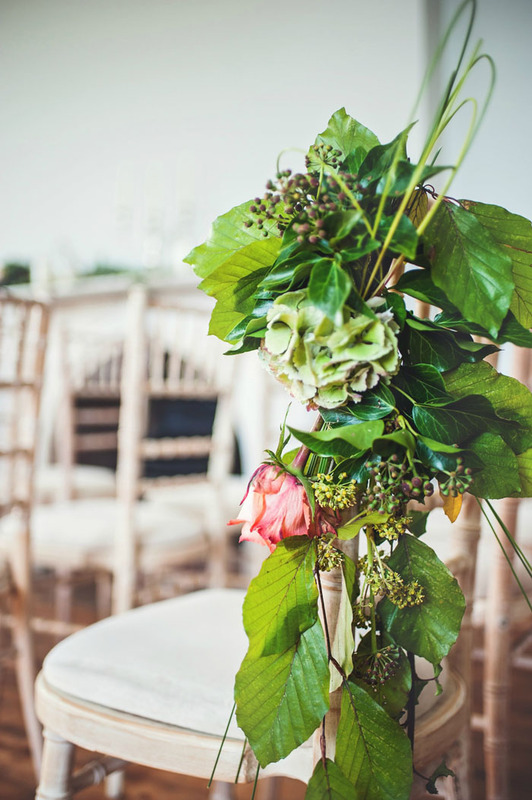 The enchanting chair-ends in the civil ceremony setting were created using Julischka rose, hydrangea and steel grass fashioned into a subtle heart.